I am a natural blonde. I started dying my hair about 4 years ago when I was 17 because I noticed that, like my mom, my pretty blonde locks were starting to grow in a darker, more ash brown shade. I had always taken a lot of pride in being a blonde, so when it started to change color I just decided to speed up the process. I’ve been a few different colors since then, but I have been red the longest. For the last couple years and a year before that I’ve had red hair. I kind of feel like I was born to be a red head. However, for the last several months I’d been playing around with the idea of going blonde again and last night was just in a “whatever lets try it” mood. I wanted an inexpensive option to play with and planned to just re-red it if it ended up looking disastrous. My plan of attack? Color oops and an box of $3 Dark Ash Blonde hair dye. I knew that bleaching would be much more harmful and potential more expensive by the time I got toner and all those extra products. So I spontaneous decided to go the walmart route. The directions were pretty simple to follow and basically mimic your standard box dye instructions except the fact that when you’re done applying the solution you cover your head with the supplied shower cap thing. The formula is very runny and watery which I didn’t realize until I almost got it in my eyes. If you think it smells bag when you’re applying it, no…as it develops it starts to smell like rotten eggs…and it will continue to smell like that for goodness knows how long. If you’re like me, you might consider using a hair dryer to speed up the developing process, don’t. The instructions specifically say not to do this for whatever reason. It is safe to recolor the same day after using this product, but it is recommended to use a protein conditioner before doing so. I also wouldn’t recommend bleaching unless you want dead hair. I was super skeptical when purchasing this product. I fully expected it to be a complete waste of $10. However, I was shocked when I started rinsing my hair to see blonde strands. Shocked. I hadn’t seen my hair that color in years. Now, because the red dyes I’d used before lighted my hair, it wasn’t its original, brown-y or whatever color its supposed to be now but it definitely got all the red out. 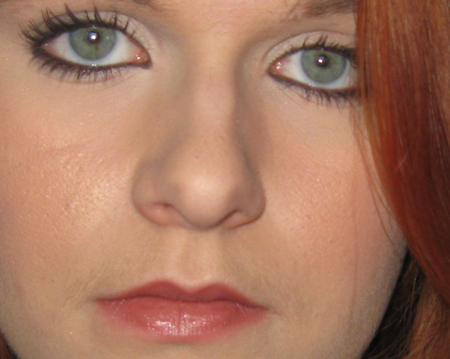 I’m attaching a before and after picture (they aren’t supposed to be flattering, just to show color. haha). And just for fun, I’m throwing in a picture of what it looks like after I went over it with the $3 box color. Verdict? I was insanely happy with this product and I’m ashamed to say that I didn’t think it would work like this. This won’t work for blues, purples, pinks, etc. And I’m not sure how going black to blonde would work. But other than that, I recommend it! If you try this with darker colors send me your before and after pictures! I’d love to see how it works on black or brown hair. Coming up! My first ipsy bag has been shipped! So look out for my unbagging(?) post coming up next week! So today I shall be reviewing for you Revlon Colorstay foundation for combination/oily skin. I’m definitely one of the last people to probably review this but I was really excited to try it so I wanted to go ahead and review it since I’m in one of those modes these days. I’ve heard tons of good things about this foundation and when bloggers whom I know usually go for high end brands rave about something from a drug store, I know it’s something I need to try. I’ve been battling for years to find the perfect liquid foundation. Most of the ones I’ve tried don’t last long, sink into pores, aren’t my shade, are too dewy , etc etc. 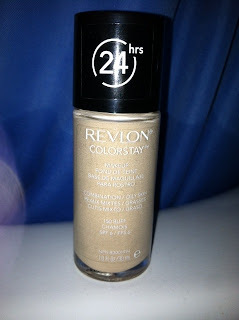 Revlon Colorstay usually retails at most drugstores for about $12 but at Walmart it was actually $10, so that was my first plus. I purchased this in the shade Buff after some initial online research. Ivory and Buff are the two lightest shades though Ivory is for those with pink undertones and Buff is more neutral/beige with a very, very slight yellow tint. When I first applied this, I was a bit worried that I had picked the wrong color as I normally wear Cover Girl Clean makeup in Classic Ivory ( which is what I’m ultimately comparing this too throughout the review). Buff is slightly more yellow but when blended, it actually matched my neck perfectly which has never happened with a foundation before. I applied this my pouring a little on the back of my hand and blending onto my face with my ELF large stipple brush. The first thing I noticed was that this was slightly thicker than my CG foundation and that it provided almost full coverage immediately with the first application. It blended into the skin very easily. It does have kind of a scent to it but its not too overwhelming. I applied this at 8 in the morning and it is now 4 in the after noon, which means this foundation has been on for 8 hours. I did set this foundation this morning with my Rimmel London Stay Matte pressed powder and only now have I had retouch with pressed powder as I was starting to look a tad oily. I did that about five minutes ago and after doing so, it literally looks like I just applied this foundation. There has been no settling or separating, it still looks great. This says that it will last 24 hours. Now, I’m not actually going to stay up 24 hours just to tell you how it looks but I would say that if it still looks good now, it will easily last for the rest of the day. Of course, this is only my first day using this foundation but if I was judging on first impressions only, I would say that I have probably just found my favorite foundation, finally ending the life time search. This does have a matte finish, which I’m not a huge fan of but as you can see from the photo, I’ve applied a blush with some shippers in it to liven up my face a bit as you could easily do the same with highlighters or whatever. The photo was taken after about six hours of wear and you can see it still looks pretty good.I do have some issues with acne/large pores which I think it covered quite nicely. Also, I should note, I did not use a primer. After this amount of time, my cover girl foundation would have already halfway melted off or settled into my pores, especially without a primer. So, obviously, I’m quite pleased with this foundation. I will continue to use it for the next week or so just to make sure I don’t have any issues with breaking out but right now, I love this and I can see why it has been so popular!